Insert the main disc from the set, the one containing the actual documentary, and on the "Main Menu" select 'DVD Notes' to get to the screens with the DVD production credits and notes. Go through all the pages of these DVD notes and on the last page, highlight the from the "Back" menu entry. 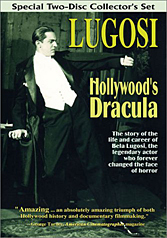 Now, press your Down button and Bela Lugosi's talisman will be highlighted. Press your Enter button and you will have the pleasure to view 'chair', a 30-minute mockumentary about Bela Lugosi's chair. It is a labor of love, so make sure to check it out when you have this disc.